Jeremy Irons narrates this Seeds of Freedom Documentary regarding the GMO seed debate. While most people consider the nutritional and potentially toxic effects of GMO use, this video points out that this is also about the freedom of small farmers world-wide to be independent, to not have to rely on purchasing seeds every year to feed themselves and their communities. The control of seeds and the food supply is a political issue. Vandana Shiva is interviewed as are members of British parliament and their government, and many more. I went to high school in the beautiful state of Iowa. From the meandering Mississippi to the fields of wheat and corn that stretched beyond sight, it was also inhabited by some of the nicest people you’d ever want to meet. I remember in the fall students returning to school as brown as nuts. These students had spent the summer detassling corn, a process where the tassle is removed to prevent pollination. Thousands of Iowan acres were detassled by hand and the students were glad for the income. The detassling was done for hybridizing corn. 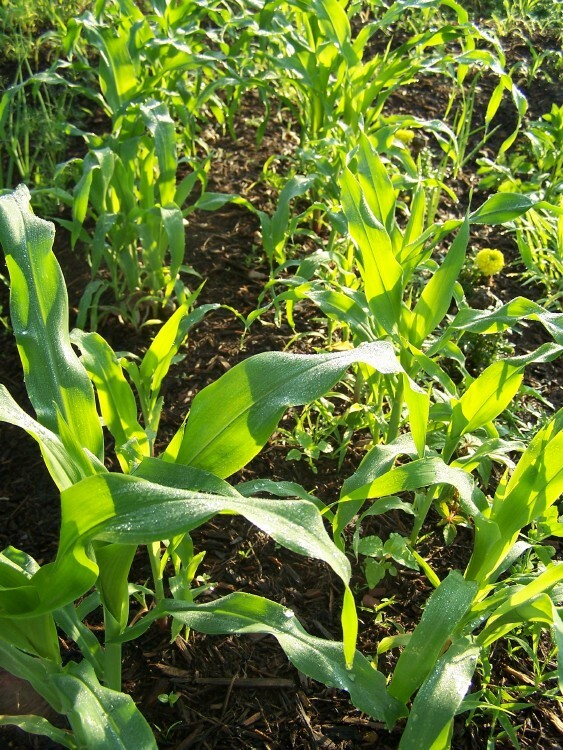 The tassles of most corn are removed while the pollinator rows are left intact. This creates the hybridized, higher yielding corn. Fast forward to present day. Instead of relying solely on the genes present in the corn, corporations have inserted genes for certain traits into the plants and we call them genetically modified organism, or GMOs. Over and over I read and hear proponents of GMO’s stating that with population growth GMO’s are necessary to feed the world. While I disagree with the logic of a statement that says “the undesirable should be accepted in lieu of something worse,” I am going to give the first statement the benefit of the doubt and test it, and see if it stands up to logic. A casual glance at the research shows that forty percent (MSN Statistics) of U.S. corn is used to make ethanol. So 40 % of each years’ crop isn’t feeding anyone. People are dying of starvation all over this planet, and here we literally burn food to fuel our cars. When almost half of the corn produced is literally burnt, the feeding the world argument falls apart. BTW, Ethanol is very hard on automobile engines that were not created to handle it. It burns at a higher temperature, decreases fuel efficiency, and destroys the plastic fuel intakes on fuel pumps – very expensive indeed. And even the EPA admits that it is worse for the environment than its gasoline counterpart. Despite this, evidently the EPA has signed off on increasing the blend allowed from 10% to 15%. Google what this will do to your engines. It’s especially frightening when you consider examples from mechanics that gas companies are already sneaking in higher levels of ethanol. Here’s what Consumer Reports says about the matter. GM corn has been proven to cause cancer in rats and mice at levels that are allowed in drinking water. GM crops treated with glyphosphate cause disease, from diabetes to obesity to heart conditions. This may sound like a stretch, until you see the explanation of Dr. Stephanie Seneff, MIT researcher. Monsanto claims glyphosphate, the active ingredient in Roundup (c) is harmless to humans since it affects the Shikimate pathway of plants. Since human cells do not have this pathway, they claim it is harmless. As Dr. Seneff points out, however, the human gut bacteria outnumber our human cells in our bodies 10 to 1. It is estimated that each human carries 10 billion bacteria cells, each of which DOES have the Shikimate pathway. When our intestinal balance is destroyed, Seneff shows that other health problems emerge. GM crops creates monopolies. Imagine all the worlds major crop seeds in the hands of a few corporations. Nuf said. GM crops are weakening U.S. exports. Recently, India announced that it would be buying GM free soy beans from Brazil. Personally, I love Brazil, but I am sad that crops that used to be the strength of this nation are being lost. I was born in Decatur, IL while it was crowned “the Soybean Capital of the World,” and it is about to lose that crown, if it hasn’t already. I remember as a little girl driving over a large bridge that went through Decatur past the Staley’s plant. We called it Staley’s bridge, because the smell of the soy processing was so overpowering we had to warn each other to plug our noses. Well, many countries don’t want our GM products, including Japan who just cancelled a large wheat order when the story emerged last week of rouge GM wheat found in an Oregon field, as described here by The Wall Street Journal. Korea and Taiwan and considering their U.S. imports as well. This is a nation built of hard workers. People who took great risks, leaving foreign lands and families to build a better place. Farmers in this country are the embodiment of the virtues that built this nation – hard-working and self-sacrificing. It is such a shame to watch their international markets shrivel. Now more than ever it is important to look at why other countries have banned GM products and to turn the tide before all confidence is lost internationally in our ability to produce safe, delicious and nutritious food. This country was the bread basket of the world. Please think about it!